What is Rendezvous? 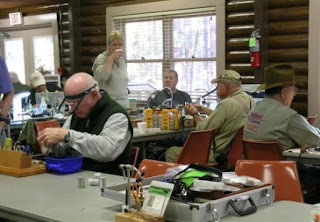 Twenty-five years ago, a group of fly fishermen from Texas, Louisiana, Arkansas, and elsewhere decided to get together for a weekend to fish and tie flies. They found the facilities at North Toledo Bend State Park to be ideal. Since then, the tradition has continued and grown. There's no planned activities, but plenty of fly tying, food, fly casting and fishing, with only a minimal fee to cover lodging and meals ($40 weekend, $20 day or night). The activities take place at the park's group facility, which features a commercial kitchen and dining hall, and lodging available for up to 150 people in 5 heated log bunkhouses (30 beds each). There's also a heated central shower and restroom building with nice night lighting on all the sidewalks and a large main log building with A/C, picnic tables and a large barbeque trailer. Held the first weekend of November each year, the Toledo Bend Rendezvous (aka Southern Fly Fishers Rendezvous) is co-sponsored by the IFFF Texas and Gulf Coast Councils. It remains one of the top tying events in the country, with many of the attendees featured at regional and national expos. Our next general meeting will be Monday, October 26, at the Rapides Westside Library in Alexandria. Casting practice begins at 5:30pm - weather permitting - with meeting starting at 6:30pm. For this meeting, our resident Calcasieu guru, Morris Houck, will talk about his favorite spots and strategies for fall fishing the Calcasieu estuary for redfish, speckled trout, flounder and other species. 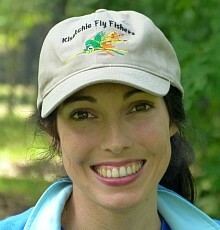 Both fly fishing and conventional fishing will be discussed, with an emphasis on kayaks. This world-class saltwater fishery is just two hours from here, and the best time of the year is now thru Christmas. As always, the public is welcome. 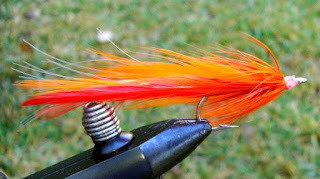 Our next fly tying session will be Tuesday, October 20, at the Rapides Westside Libary in Alexandria. Time is 6:30pm. Please note that this is a Tuesday, not our usual Monday! This month's pattern will be the Seaducer. Catch Cormier featured it in the January, 2015 issue of Louisiana Sportsman magazine. Seaducers are perhaps the most overlooked fly today. They’ve been around since the late 19th century, and have been used for every predator species from brown trout to tarpon, and even a world record redfish taken by Chico Fernandez. The Godfather of Fly Fishing, Lefty Kreh, writes in his book, Presenting the Fly, that Seaducers are “one of the best patterns for both large and smallmouth bass that I’ve fished. I never make a trip without some of these in my box.”. Despite its many accolades, this fly is seldom seen in fly shops. But if you tie flies, good news — they’re easy to tie. As always, beginners are welcome. Bring your tools if you have some, materials will be provided. The club has a few toolsets for those without tools.